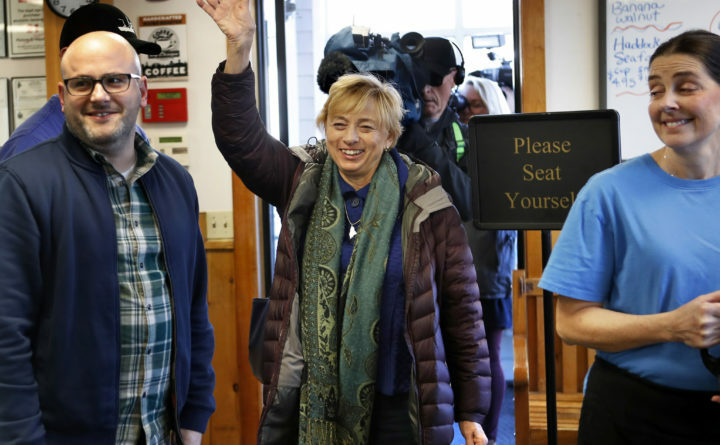 Gov.-elect Janet Mills, center, acknowledges applause from customers as she arrives at Becky's Diner, Wednesday, Nov. 7, 2018, in Portland, Maine. Good morning from Augusta. Gov.-elect Janet Mills was moving into the Blaine House this weekend. She will take the oath of office to succeed Gov. Paul LePage this evening before delivering an inaugural address that she has only dropped scant hints on so far. Health care and education should be among the key focal points of the Democrat’s address as she looks to implement voter-approved Medicaid expansion with a promise to not raise taxes in her first two-year budget hanging over her first-year agenda. On health care, early days of Mills’ governorship will be marked by implementing policies he blocked and attempting to insulate Maine from Trump’s ongoing efforts to reverse Obama initiatives. The texts of only 25 of the bills to be proposed in the new Legislature have been released. The first one would put many of the consumer protections in the federal Affordable Care Act into Maine law and it’s the only one to be backed so far by Mills and the Democratic presiding officers in the Legislature. It’s aimed at insulating the state from potential changes to federal law, though it’s mostly a symbolic step with big changes unlikely in the next two years because of divided government in Washington. Medicaid expansion will dominate the early part of Mills’ health care agenda. LePage, a Republican, blocked the implementation of expansion in 2018 amid a court battle with advocates while saying the Legislature hadn’t found “sustainable” funding for the law. This was true, but a judge ruled against his last-ditch effort to stop implementation last month. Mills had proposed paying short-term expansion costs with $35 million in tobacco settlement money. She said after her November election that she wants to implement it using “existing funds on day one,” which looks like a nod to a Medicaid surplus that could be enough to pay for expansion over six months. A long-term funding plan, however, hasn’t been outlined and should be one of the main legislative focuses of the first year of Mills’ administration. The governor-elect hasn’t committed one way or another to undoing stricter Medicaid rules endorsed by LePage and recently approved by the federal government, but it’s seen as a likely step. One address doesn’t define the early part of a governor’s tenure, but they typically hit the high points and Mills has already shown many ways that she’ll differ from LePage. At this time in 2011, we heard from LePage, who led a Republican takeover of Augusta and pushed collaboration with the Legislature, which he often warred with during a tenure that included the first government shutdown since 1991. But he pushed welfare and education changes that became the focal parts at different points in his tenure. Other than their similar ages, Mills and LePage couldn’t be more different on policy or personality. He was homeless at age 11 and built his resume on private-sector experience; she comes from one of Maine’s best-heeled political families and began working in government in the 1970s. While LePage largely looked outside of government for his key advisers, seven of Mills’ nine announced nominees for commissioner spots so far have been people who would be getting elevated from other state and local government jobs in Maine. We’ll hear more tonight about what they will be doing. The new governor’s inner circle is widening. On Monday and Tuesday. Mills announced six executive branch staff hires and another Cabinet nomination. Mills selected Jerry Reid, her former employee as natural resources division chief in the Maine Attorney General’s Office, to be the next Department of Environmental Protection commissioner, and she hired Elise Baldacci and Bethany Beausang as senior policy advisers. Reid has been chief of his division in the AG’s office since 2007 and has more than 20 years of experience working for the department, Mills said. Beausang, 47, an attorney, worked for seven years, until 2018, as district representative and counsel to U.S. Rep. Chellie Pingree, a Democrat who represents Maine’s 1st District. She previously worked for former Republican U.S. Sen. Bill Cohen and U.S. Rep. Tom Allen, the Democrat who preceded Pingree. Baldacci, 31, is an attorney who has worked for the Maine Credit Union League and Maine Street Solutions, a public affairs and governmental relations branch of the law firm Verrill Dana. Her uncle is former Gov. John Baldacci. Together, the pair will oversee and advise Mills on policy and legislative issues and act as her liaisons to the Legislature. Mills also selected Dorian Cole as director of constituent correspondence to handle policy correspondence for Mills; Martha Currier, director of constituent casework, a liaison between constituents and state government; Michael Perry as her special assistant in charge of scheduling, and Melissa O’Neal as her director of boards and commissions. — The departing governor pardoned a former Republican lawmaker for a 35-year-old drug trafficking charge. Maine Public reports that former state Rep. Jeff Pierce of Dresden, who had requested clemency for the conviction, was notified that LePage had signed a pardon last week. Democratic campaign workers in Maine had highlighted Pierce’s conviction in October. Pierce, who was considering a run for a GOP leadership position in the House until he lost his re-election bid to Democrat Allison Hepler, said at the time that he went from a “stupid kid” to “a pillar of the community.” The pardon could affect an ongoing investigation into whether Pierce illegally hunted with firearms after his felony conviction. Here is his soundtrack. — A Maine Republican Party stalwart is now the voice of the Pentagon. Former Maine secretary of state Charlie Summers took over Tuesday as chief spokesman for the Department of Defense. A Navy captain, he is currently the commanding officer of Naval Reserve Naval Information U.S. Naval Forces Europe-Africa/U.S. 6th Fleet and on Tuesday added the duties of acting assistant to the Secretary of Defense for Public Affairs. A former state senator, Summers won the Republican nomination twice to run in Maine’s 1st U.S. House District and once for U.S. Senate, but lost each time. — Are you ready for 23 months of presidential campaigning? Apparently, Massachusetts Sen. Elizabeth Warren is. The Associated Press reports the progressive Democrat has launched an exploratory committee for a presidential run in 2020. Warren is the most prominent Democrat yet to signal a presidential bid, but she enters a Democratic field that’s shaping up as the most crowded in decades, with many of her Senate colleagues and other prominent Democrats openly weighing campaigns. In mid-December, former Obama housing chief Julian Castro also announced a presidential exploratory committee, which legally allows potential candidates to begin raising money. Outgoing Maryland Rep. John Delaney is the only Democrat so far to have formally announced a presidential campaign. Here is their soundtrack. This is the last Daily Brief to be published during LePage’s tenure as governor. It’s been a long, strange trip. Click here for a summary of that journey. Click here for an overview of our efforts to make sense of it during the past eight years. And click here to read a selection of thoughts from Mainers about the impact LePage had on their lives. The feisty Republican has certainly given us plenty of fodder to get readers’ adrenaline flowing with this morning newsletter. We’re grateful for that, although we wish he would have spoken directly with us more often because that kind of person-to-person communication tends to reduce misunderstanding and yield more constructive conversation. Then again, we’ve seen in recent years that intentional misunderstanding can be the basis for effective campaigning, fundraising and political base fortification.